How the Poecilotheria metallica brought him back to the hobby Admittedly, maintaining tarantulas on my part has oscillated between waxing and waning throughout the years—a sudden interest usually results in the acquisition of a species or two, only for me to lose focus and leave the hobby, at least temporarily. Let’s face it: tarantulas, as a whole—with the exception of species such as Euathlus sp. ‘Red’—are non-responsive ‘pets’. Many species just dig a tunnel or extensively web their enclosures, so keepers often wonder whether they are keeping an animal or a hole. As such, their novelty quickly dissipates and the tarantula is sold or worse, neglected and left to die. Many novice keepers go through this phase of disillusionment; I did. By mid-2015, I once again felt an upsurge of interest in these arachnids, due to my discovery of a population of two species of tarantulas in my area which provided me with intriguing insights of how terrestrial tarantulas live in the wild. To further stoke the embers, a co-worker sold me a specimen each of a 3-inch (total length or TL, including the outstretched legs) Curly hair (Brachypelma albopilosum) and a 2.5 inch Mexican Red-knee (B. smithi) a few months later. I was once again bitten, so to speak. 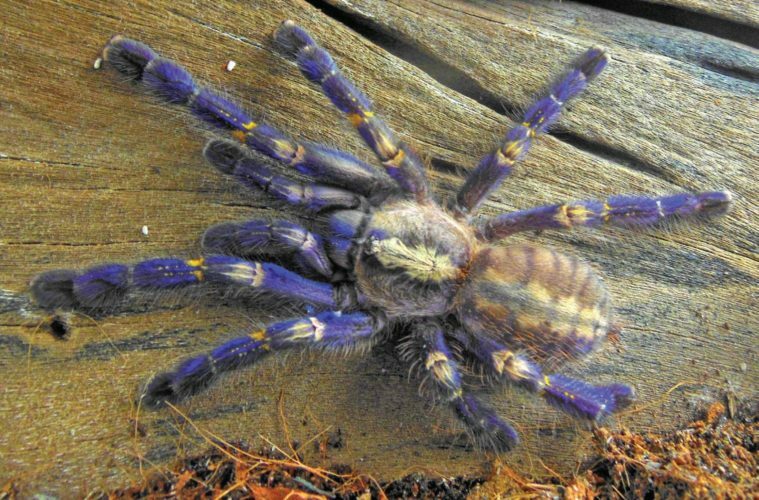 In early 2016, I searched online for tarantulas being offered for sale, and came across an advertisement for Poecilotheria metallica slings (the hobby jargon for ‘spiderlings’) being sold for R1,100, at 1 inch TL sizes. I was familiar with the genus, but had never kept one before, so this prompted me to undertake thorough research on their needs, behavior, and temperament. I absolutely believe that an enthusiast—whether for plants or animals—should do this before actually acquiring a specimen. Too many impulse purchases result in frustration and/or demise of the acquisition. In February, I got my new P. metallica and nicknamed the tiny, scruffy creature ‘Hammett’, alluding to the lead guitarist of the band Metallica. 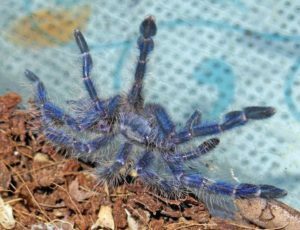 A little background – The Poecilotheria metallica is known in the trade by its common name ‘Gooty Sapphire Ornamental’, ‘Metallic Blue Ornamental’, or simply ‘Sapphire Ornamental’. The former refers to the locus classicus, or the type locality, of the species, which is endemic to Southeast India. However, despite being first collected in an engineer’s bungalow on the north-west line of the Madras Railway in Andhra Pradesh near Gooty in 1898, it is generally believed that the holotype, a female, represented a stray specimen which could have come elsewhere, particularly the railroad services locomotives that bring in timber from other regions. 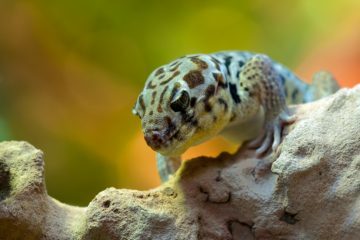 In 2001, the species was rediscovered in a degraded forest between Nandyal and Giddalur. For this reason, I avoid names for this species with any reference to Gooty. Likewise, I also do not refer to the species as ‘P. met’ as is often the case within the hobby, as I find the practice of abbreviating tarantula names rather unnecessary. Hammett was initially kept in a small, 1.5 gallon tank with coconut coir substrate and a few twigs he could climb on, which I soon discarded. Knowing that metallicas are markedly photosensitive, I placed the tank in a shaded corner. He still did try to hide from view by constructing a cozy burrow. The area where I maintain my arachnids commonly gets quite warm during daytime, but this is offset by breezes coming in from the mountains behind my property, and from nearby Laguna Lake. Light misting using a hand sprayer were carried out at least twice each day but it was only directed opposite of where Hammett constructed a retreat. On the fifth day, after making sure he had settled down, I offered a mealworm about as long as he was. A little commotion and some twitching of the mealworm’s tail end told me what I needed to know: Hammett was happily adapting to the conditions I’d provided, as signified by his willingness to eat. Poecilotheria metallica, like other members of the genus, are greedy feeders, and I have noticed that my specimen can easily down prey items that are slightly longer than he is. This should come as no surprise, as the potent venom that Poecilotheria species are known for allow them to overpower sizable prey items with minimal risk of retaliatory response from a defensive quarry. 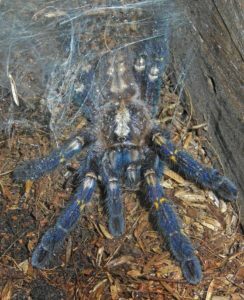 By the end of February, Hammett molted, but it was only after he sloughed off his old exoskeleteon on April 10 that his formerly subdued coloration completely gave way to the brilliant blues that the species is celebrated for. In May, I attempted to photograph him using a black cloth to block off distracting details that are visible from behind the transparent tank panel, and gently coaxed him into position using a thin and slender twig, with much of the screen top positioned to block escape. About half a minute after he settled in a spot conducive for a photograph, I slowly removed the screen top, and very slowly positioned the camera inside his enclosure. And then it happened. The tarantula ‘Flash’? – Faster than I could react, the spider bolted out of his enclosure and onto the folds of the black cloth. As I was maneuvering into position, he again moved up extremely quickly, this time in a position that was ideal for a photograph and, more importantly, for recapture. This little episode underscored a facet of Poecilotheria husbandry that should be a prime consideration for would-be keepers: they move at lightning speeds, and without warning. Many tarantula species telegraph their intentions with discernible actions: Thrixopelma ockerti press their carapaces to the substrate prior to the flicking of urticating hairs; Brachypelma boehmei, a skittish member of an otherwise laid- back genus position themselves in the direction where they intend to go before making a run for it, and highly aggressive species stridulate and assume a defensive posture before an actual attempt to bite. Poecilotheria do not give the same courtesy. Weeks after his ‘stroll’, when he reached a sufficient size for better observations, I also noticed how he could pounce on an offered prey item without even giving a hint that he was aware that he wasn’t alone anymore inside the enclosure. The location of the prey relative to his whereabouts is immaterial: a metallica can attack from Point A to B at blinding speed. Apart from being an ambush predator, P. metallica can and will take a more active role in securing prey through quick lunges. You won’t see them stalk like you would Horned Baboons (Ceratogyrus ssp.) or Orphnaecus once they have perceived the presence of potential prey; they just go straight for it. When I moved him into his present enclosure in October, he unnerved me once again by making a quick exit after I was able to get him into his new home. Rather fortunately, despite being prone to making swift dashes, P. metallica does so in short bursts, which means that an escapee will settle just mere inches from where it took off. Of course, it might be a different story if your animal alights on any spot of your body, and your orchestrations startle him into bolting somewhere more distant and unreachable, or worse, into a defensive mode, punctuated by a bite. Always keep in mind that even though bites are probably not fatal, Poecilotheria venom causes an excruciatingly painful experience that can land a person in a hospital. Events such as these, when caught up by media and sensationalized, can adversely affect the hobby. Compared to other species from its genus, P. metallica is far less defensive, and when disturbed, most often resorts to running or, in more open areas, leap into the air and onto the ground or nearby objects. Yet, bites from sufficiently provoked individuals are not unheard of. And be aware that intolerable levels of provocation varies from one tarantula individual to another. A calm specimen can be gently cajoled into position for a photograph, but this same treatment may be construed as an attack by another, which will then react defensively according to its temperament. Practical husbandry tips – You can find many references saying that this species can be kept communally, and indeed, they are less disposed to cannibalism than other tarantulas. A batch of spiderlings raised in a suitably sized container may coexist peacefully with one another for a period of time, but once reared separately, they often become antagonistic towards others of their kind. So unless you are willing to lose some individuals, or are scandalously wealthy, I strongly advise against keeping two or more individuals in one enclosed space, except for the purposes of breeding. As of this writing, Hammett has grown to a total length of 4 inches, or quadruple his size when I bought him. One can only guess what his measurements will be once he reaches his first year under my care, especially since he has never failed to molt each month. True to form, the carapace and abdomen are decorated with white fractal patterning flanked by thin, blue-grey stripes, and his tibiae are a vivid yellow. I offer him large moths, katydids, and cockroaches about twice a week. While most keepers will invariably frown at the latter food item, I hasten to add that that they are safe to use for as long as one does not use insecticides around the house. For water, I just gently mist the enclosure once a day, four to five times a week. I do not provide a water receptacle for drinking as I have never seen him drink anyway, but you can do so if you are so inclined. Note that despite being arboreal, P. metallica does not often employ branches as their perches, preferring instead walls or any other substrate with large surface area for lounging out, so you can forego such decorations, which might become a liability when doing maintenance work inside the enclosure (i.e. you may not be able to withdraw your hand quick enough if you notice your animal “waking up,” or even worse, you might knock over the piece and have it land on your pet, resulting in a very messy—and pricey—demise. To combat molds in a humid enclosure, I recommend using what is often termed a ‘live substrate’, or one with a healthy population of springtails (Collembola ssp.). Springtails are commonly found in decaying leaf litter, but you can ‘invite’ them in by using a sliced potato as bait. In my enclosures, it is not unusual to find even small millipedes and mushrooms appearing periodically, which attests to a truly functioning substrate. Excessively humid terraria encourage the appearance of mites; providing adequate ventilation inhibits this. In the wild, P. metallica occupy perpendicular tree hollows and crevices and seal themselves in with their webs. In terraria, in the absence of similar structures, they either burrow into the ground or construct mostly vertical tubes using their web and pieces from the substrate, which still renders them rather visible even when they are hiding. If you are doing something inside their enclosure and you notice them moving inside the tunneled web, even in a retreating direction, stop altogether and withdraw your hand as calmly and as gently as you can. They are out in the open at night, which precludes any maintenance on your part. But you can take photos if you are really careful and alert, and if your tarantula’s demeanor allows it. Final advice – To sum it up, Poecilotheria metallica is a true pièce de résistance of any arachnid collection. 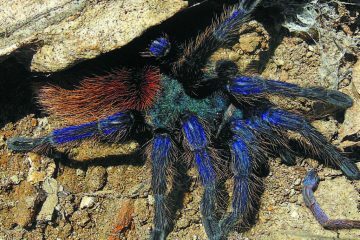 Many other tarantula species sport blue colorations, but P. metallica’s combination of inherent color intensity and contrast patterning is truly outstanding in the world of tarantulas. Coupled with their size and propensity to be out in the open, particularly during nighttime, guarantees favorable responses from guests who don’t share your (misplaced?) love for tarantulas. However, they are by no means a ‘starter’ species, and a whim-driven acquisition can have disastrous consequences for either or both the owner or the spider. If you are a novice, I suggest you earn your dues first by keeping relatively docile species from Aphonopelma and Brachypelma before moving in to more defensive, terrestrial species and then later on, to arboreals. As for me, I think there is no more looking back as I have more species that I am currently eyeing for acquisition—much to the consternation of my disapproving girlfriend, although I have heard her make affirmative comments on Hammett’s colors. This story appeared in Animal Scene’s April 2017 issue.